I was so saddened to read last night that the beautiful, voracious, mermaid come to life, Esther Williams had passed away. She was such a stunning beauty! I can remember watching her movies growing up, I loved “The Duchess of Idaho”! It came on one morning on TCM when I was sick and home from school. That was one of the best parts of being sick, I got to watch TCM and AMC. It was heaven, all those old movies! I would pretend to be her when I was little. 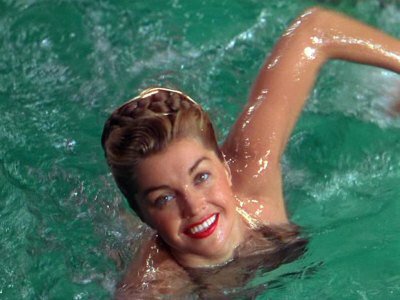 I would dive into the pool and do my best Esther Williams impersonation. Swimming in circles, doing acrobatics underwater and twisting and turning and splashing about. I was just fascinated by her. Her swimsuits, her hair, the wonderful glow of technicolor that surrounded her. She had a beautiful body and a stunning pair of legs! My Nana always tells this story that her sister, Katherine, another “looker” with a great pair of hams, was asked to be in Esther’s swim troop, but she declined as she was madly in love and getting married. Who knows if that is entirely true or not, I just love that story regardless! I believe there is a grain of truth in there somewhere, no matter how tiny the grain! To the mermaid with legs, you will be missed! This entry was posted in Life and tagged Esther Williams, family, love on June 7, 2013 by jennifermichie. I’ve always loved Esther Willisms’ movies–just plain fun and that era had such lovely hair and wardrobe. I saw a piece from 2007, I think, where Diane Sawyer visited Esther W. and they talked about her films and even took a swim. Esther W. was 84 or 85 then and still lovely and so gracious. Wish more of the famous had that trait in our day. Thanks for remembering her in your post.